My original intention was to do a Valentines Day Mantel to share but I just could not pull it together. I normally do not decorate for Valentines Day so I think trying to start out with a big display was the wrong approach. Instead I decided to do a quick and easy Valentines Vignette. The little shabby table heading into our guest bedroom was the perfect spot for it. I love incorporating vintage family photos into my decorating. This photo is of my grandparents on their wedding day back in 1948. 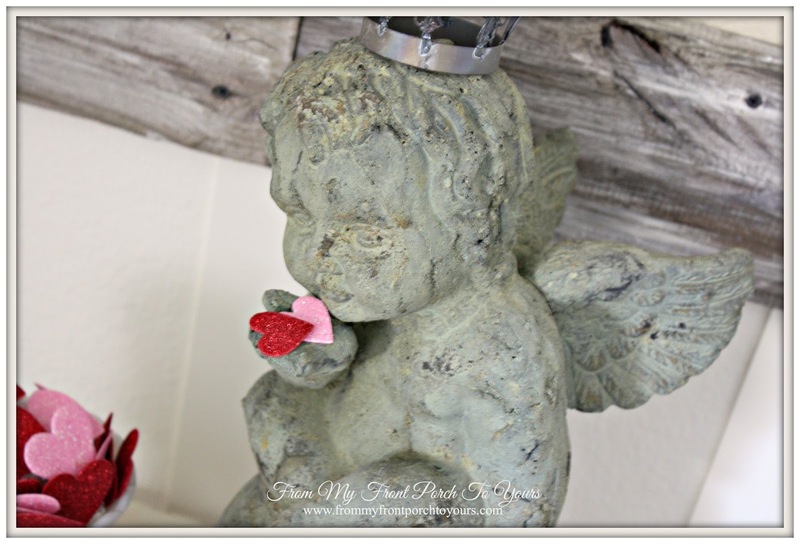 I had purchased this beautiful cherub garden statue last year at HomeGoods but had never used it. It was perfect for this vignette. 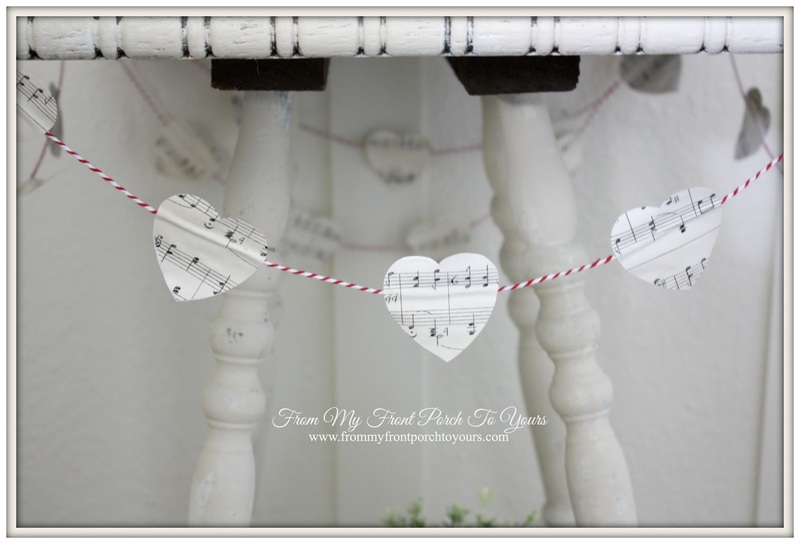 I made the cute little garland by cutting out hearts from wrapping paper and gluing them to bakers twine I had one hand. My Valentines Day decor is not much but I think it is a good start in the right direction. Something to build on for next year. Thanx for stopping by to visit! Super adorable Pamela! That cherub is perfect! Very cute I love the little heart garland. Love the cherub Pamela. That is super sweet. Your vignette is too cute. Looks great, Pamela! Sometimes simple is best, isn't it? It is perfect. I happen to adore cherubs and believe they work with everything. Crushing on your chippy cherub Pamela!!! 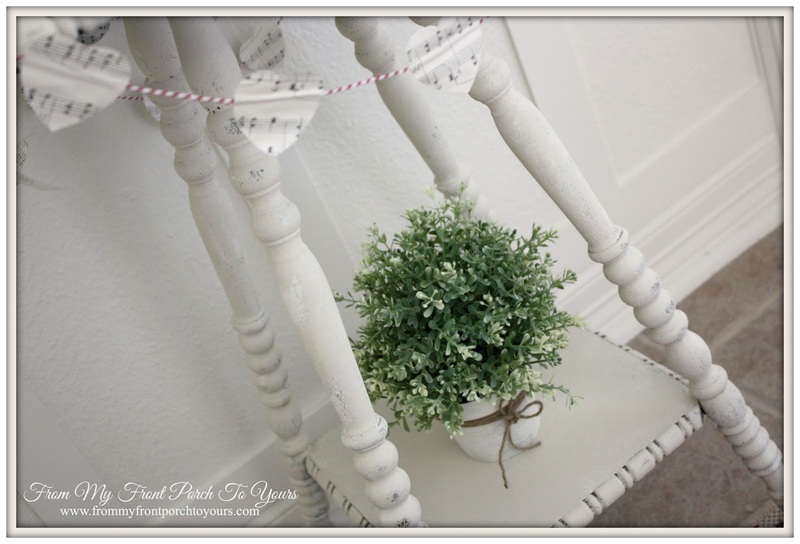 Everything in your vignette looks so pretty and I adore its simplicity! Cute vignette, Pamela! I love your sweet cherub! It's the perfect accent for Valentine's Day! Pamela, you put together such a darling vignette! The rug really pulls the whole thing together! That picture of your grandparents is priceless! 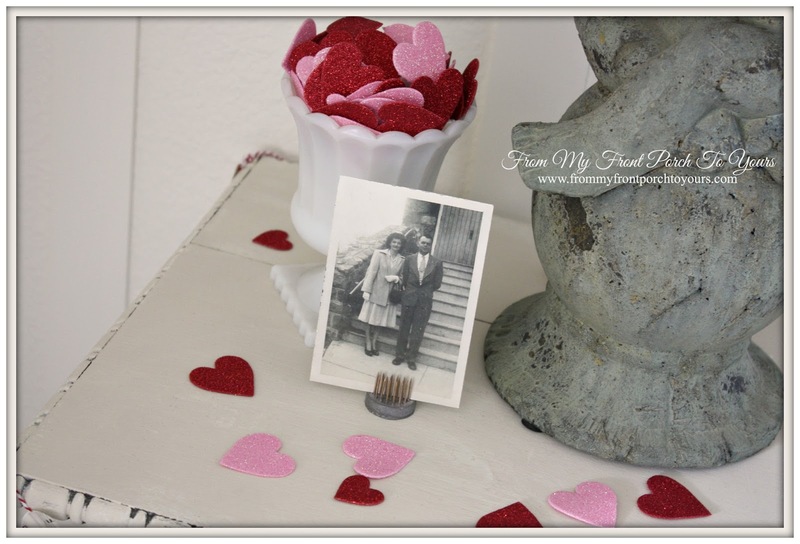 I love the idea of including an old photograph of parents or grandparents in a Valentine display. Fabulous! I think the bit of Valentine with the bit of family is perfect - especially wrapped with the banner. 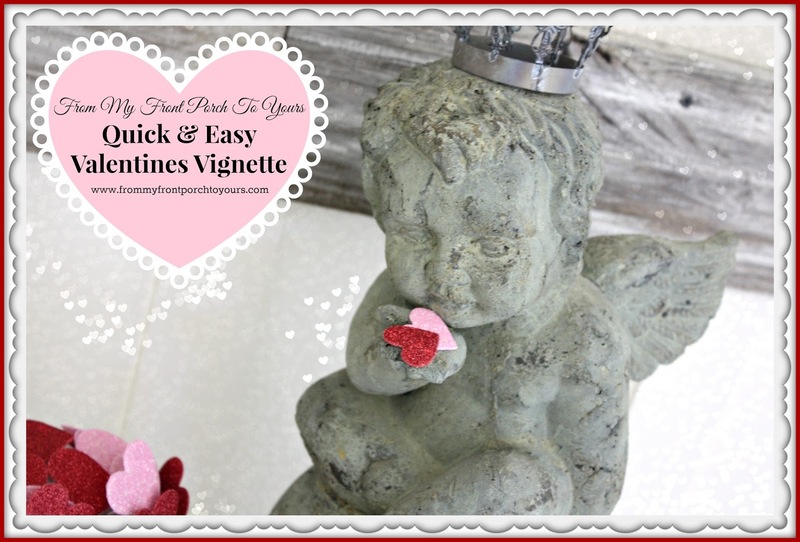 I think it's a cute Valentine's vignette, Pamela! Love your cherub and how you put a few of those paper hearts in his hand. I don't do much either, but have brought out some red things that I had - floral arrangement, books - and added them in to some vignettes. 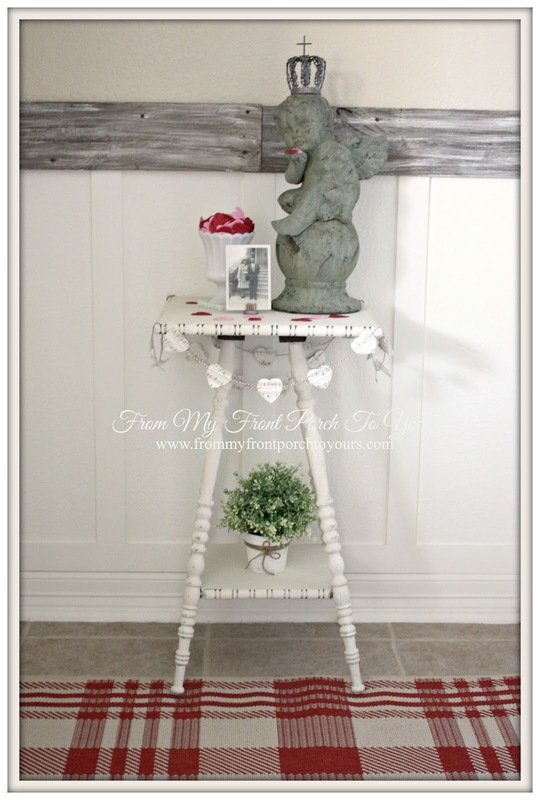 Oh my goodness Pamela...I adore your beautiful Valentine's vignette!! I have toPin this! Very sweet decorations Pamela. I love the cherub and hearts.